Belgian chocolate. Ever since I discovered the bean to bar scene, Belgian chocolate tumbled from its pedestal. It is an industrial, technical mass-made product, ripped of the wonderful flavors cocoa can bring and in general offering an overly sweet and dull taste. Yet today I review a Belgian made bar. In the vast Belgian chocolate scene, some chocolatiers have realized there is more beyond the industrial couverture every other competitor uses. These brave entrepreneurs step up to the plate and start producing their own chocolate all the way from the cocoa bean. 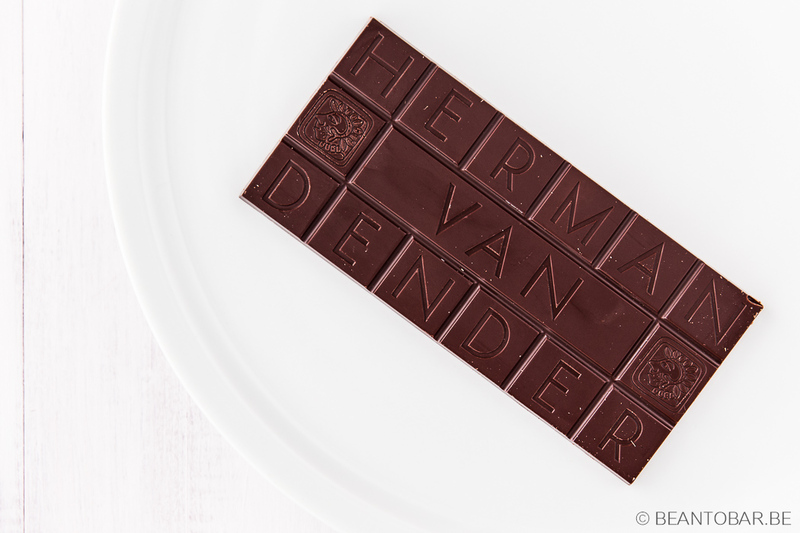 Herman Van Dender is one of the few true chocolate makers in Belgium. Based in Brussels, he followed up his parents as a pastry chef/chocolatier and became renowned for his creations. Only after a trip to Ivory Coast sparked his interest in chocolate making. After returning to Belgium, he invested in a chocolate production line. Cocoa roasting, winnowing, grinding and conching are done in house. The result is a line of origin bars and pralines made with his own created chocolate. On the table today is an old friend of mine. Madagascar remains my “benchmark” origin. I fell in love with it from the moment I tried my first bean to bar chocolate. The bar comes in a straightforward cardboard box. Dark in color, it shows an Mayan style logo and drawing, with left the origin and percentage of the bar. Flip it over and you will find an overview of the ingredients. Cocoa mass, sugar, cocoa butter and soy lecithin. A breath of fresh air compared to the labels of most Belgian chocolate, where all sorts of additives are listed. The only thing I missed was the type of cocoa bean used. Open the box and a beautiful bar emerges, protected by cellophane. The bar is executed perfectly, with small squares surrounding a larger rectangular piece. Each piece has an imprint, stating the name of the owner. Clean, sharp and inviting. Surprisingly, there was also a flyer inside the cardboard box, offering brief information on the chocolate maker. A nice touch. Aroma: Not particular strong, but when allowed to melt a little on the skin of your hand, the chocolate releases roasted bread aromas and a hint of berries and tobacco. Taste: The melt starts with toasted bread and is pretty sweet in nature. A swift moment later, twinkling red berries – red currant – trickle through. There is no bitterness to be detected, while the red fruits keep building in momentum. The chocolate melts easily on the tongue and has a very smooth and light texture, releasing flavor without any filming on the tongue. As the melt continues, dark chocolate notes mingle in with the berry flavor. Near the end, a sudden cheesecake tartness sneaks in and combines surprisingly well with the persisting red fruits. 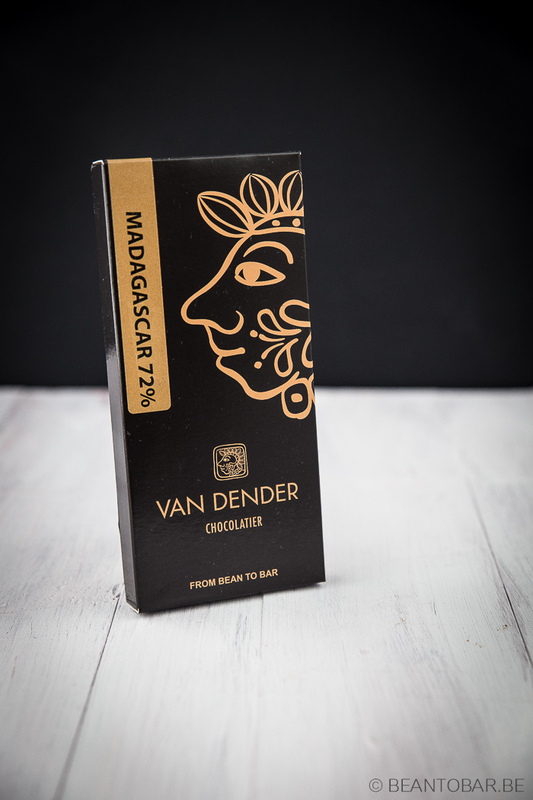 Just before the chocolate is gone, a flash of wood and roasted cacao pop up in an earthy finale, before the aftertaste kicks in. It mellows down quickly to a chocolaty remembrance that fades away softly. I’m really pleased to finally find a Belgian chocolate bar that actually goes further than the classic chocolate flavors and lets you experience the notes of the Madagascan cocoa. This Belgian bar actually has taste! Combined with the refined texture of the chocolate it is a clear winner if you want to introduce someone to what bean to bar chocolate is about, without shocking them with special of strong flavors. It is without a doubt a very nice chocolate bar that calls you back for just another piece. To me personally, it would be even better if the flavor notes were slightly bolder and more powerful. 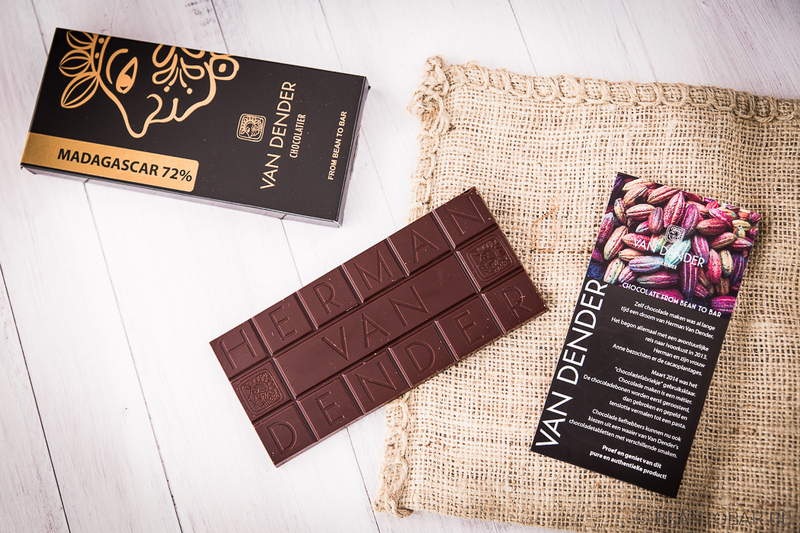 Artisan creators like Herman Van Dender show that the Belgian chocolate scene can cut above the average and can create real, tasteful chocolate!